HospitalityBizIndia.com is the online hospitality news portal to provide quality information to hoteliers and industry consultants. Launched in December 2007 by Saffron Synergies Pvt Ltd, this comprehensive website helps you source information, news, views, analysis, trends and recent happenings in the Indian hospitality industry. Our endeavour with HospitalityBizIndia.com is to feature intrinsic details on hotel operations-viz F&B, housekeeping, technology, security and front office. This unique portal aims to bridge the void of information that a busy hotelier faces due to busy schedules and travel. It will also help hoteliers to be touch with the latest trends. Our readers are business leaders, executives, managers and entrepreneurs. The subscribers and viewers are highly educated senior executives, professionals and managers interested in creative leadership, strategy, leading change, performance improvement and personal effectiveness. Interviews and sections such as ‘Day in the Life of’ enable our readers to have a closer look at their mentors, peers and colleagues. Experienced guest writers give an insight to the ground realities faced by the hospitality industry. 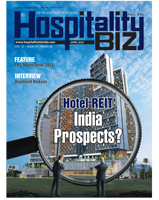 Hospitality Biz is a monthly news & analysis magazine reporting on and for the Indian hospitality industry. Presented in a crisp format, the magazine presents a holistic focus and streamlined industry-relevant news and analysis. Hospitality Biz magazine combines a range of current news stories across each of the industry’s verticals, backed by analysis and perspective. It also features dedicated sections for trends and strategic analysis. Current industrial facts and figures are carried in the magazine to help readers put their business in context as well as to provide them with a single window of research on the hospitality trade. The magazine invites comments and insights from captains of industry. New and current tourism, real estate, and hospitality-related project information are featured and updated on a regular basis. These are apart from the coverage of key trade events across the world and association initiatives.